Preheat oven to 350°F. Line a rimmed baking sheet with a silicone baking mat or parchment paper. 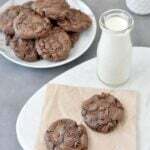 In a large mixing bowl, combine the almond butter, erythritol, cocoa powder, peanut butter powder, eggs, butter, water, vanilla extract, and baking soda. Using an elecrtric hand mixer, mix until all ingredients are well combined. It will be a very thick dough. Fold in the chocolate chips. Form the cookie dough into 1 1/2 inch to 2 inch balls. You can make them smaller to yield more cookies. Place the cookie dough balls on the prepared baking sheet. Bake for 8 to 11 minutes (begin checking on them at 8 minutes). Remove the baking sheet from the oven and place on a cooling rack to allow the cookies to cool before eating.